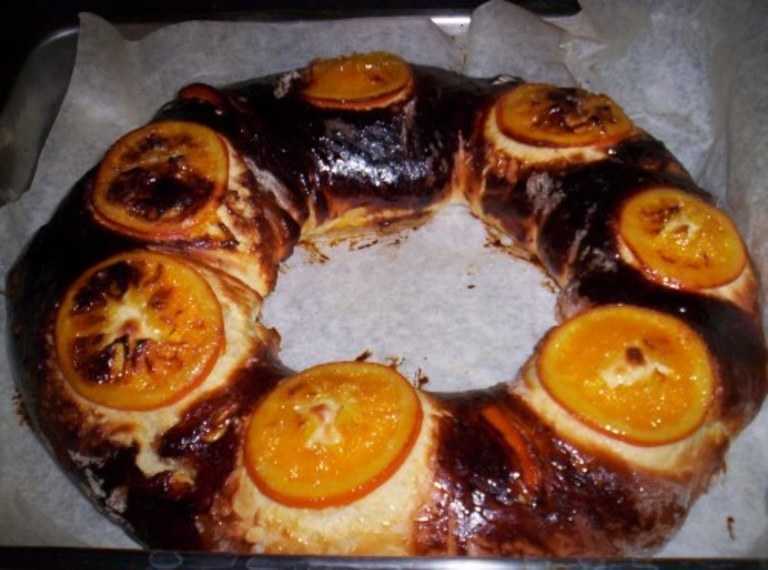 In my country we it this dessert the 6th January, for the three kings day. Its name is "tortell de reis" and normally we hide a surprise and a bean in the marzipan filling. It is said that the person who gets the bean pays the meal and washes the dishes, and the one who gets the surprise is the king/queen of the day. As we are some compatriots living in Belgium I prepared this recipe to share and eat all together one rainy Sunday evening. Although it looks dark in the picture it was not burn, just too golden because the egg yolk on top. The general opinion abut the result was quite good. Before starting I recommend you not to be impatient, because the secret of success with this recipe depends on respecting the waiting times. Sugar iced orange: 4oz of sugar, 4oz of water, 1 orange slice the orange (without peeling9 and boil it in water for 10 minutes. Discard the water. Mix the 4oz of sugar with 4oz of water until dissolved with low heating (this is very important, sugar should not be caramelized). Then add the orange slices and keep in a pan covered with the low heating power for 1hour, and do NOT remove the cover from the pan, otherwise the oranges will become hard!!! After this time remove and place them on a plate to cool down. Marzipan filling: 200g of almond powder, 200g of sugar and a little bit of water. Mix the almond powder with the sugar in a bowl. Then add a little bit of water (around half a regular glass) and keep mixing. If necessary ad more water until reaching the marzipan consistence. Dough: 20g of fresh yeast +50 ml milk +100g wheat flour 2 eggs, 100 g sugar, 200ml milk at room temperature, 100g butter, 5g salt, the grated peel of orange and/or lemon, 500g wheat flour prepare the first part by mixing the yeast in 50ml of milk and 100g wheat flour in a bowl. Keep it aside to rest for 1hour. Second part:mix the rest of the ingredients and add the first dough. Knead with energy for 15 minutes and let it rest for 2hours. After the waiting time , make a roll with the dough. then add the marzipan filling in the middle and roll the dough to keep in the marzipan inside. Curls the roll and place on the baking pan. Place the orange slices on top and "paint" with an egg yolk. Let it rest and rise for 2 more hours. Bake in a preheated oven at 200º C for 15 minutes or until golden, Be careful, control the time!! and all you have to do is to enjoy it!